The Rossignol Experience 84 HD is a piste ski that will put a smile on the face of even the most purist of powder hounds this winter! It is very responsive, playful and a lot of fun no matter the terrain. It will turn easily with the slightest command, and feels nimble and energetic underfoot. The Experience 84 HD has a strong edge grip and impressive stability which keep you having fun at both high and low speeds. This ski is happy simply cruising yet will keep on giving if pressure is added. It will allow you to really enjoy charging down the piste with just the right amount of power. This is a fantastic ski for those that enjoy groomed runs. While the Experience 84 HD is an all mountain offering, it is definitely focused more towards the piste. This does not mean that the performance is poor off piste though. The medium sized waist takes it through powder with a good float, and fantastic responsiveness means that you never feel uncomfortable in tricky situations off the beaten track. It is simply the case that the performance on piste is so exceptional, the great performance off piste pales slightly in comparison. 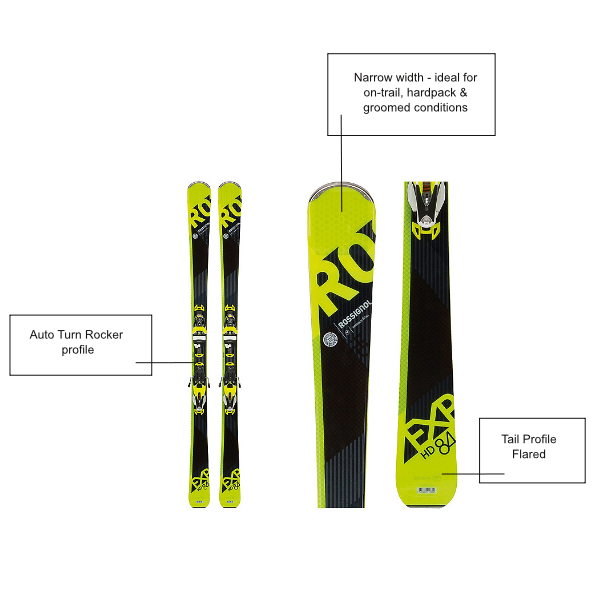 Overall, the Rossignol Experience 84 HD is a lively comfortable ski that would suit a great many people, particularly those exploring the pistes that don’t want to take it too seriously. For an all mountain ski that really shines on the piste but isn’t afraid to take on any terrain the mountain has to offer, the Rossignol Experience 84 HD is a great bet. For more great ski gear reviews and ski test reviews, take a look at our ski and snowboard gear guide.